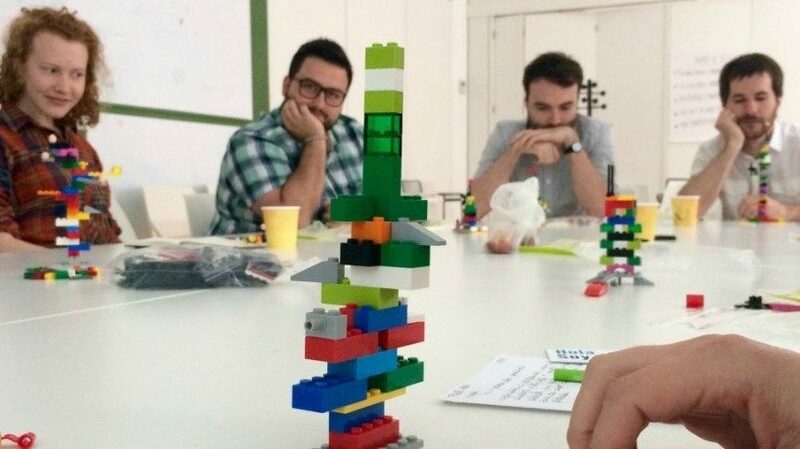 This article describes the application of Lego Serious Play to Design Thinking methodology, as well as the workshops that are taking place to investigate this adaptation. Why is Design Thinking so important to solve real life projects? What does gamification have to do with it? In this article we will see the studies and methodologies that are taking place in Spain throughout different workshops conducted by Fausto Camacho. I accompanied Beatriz Valderrama, a professional colleague. I had met her by chance that morning at an event organized by the Chambers of commerce and after getting to know her agenda, I followed her for the rest of the day and evening. Arriving at five at the coworking space for the workshop “Design Thinking with Lego® Serious Play®”, we were told the seats were limited, as the methodology did not allow “silent witnesses” and I should wait to see if drop outs occurred to participate. I really did not know what to expect. Beatriz encouraged me to stay, just in case. After a while, they confirmed that one of the twelve selected to attend the free workshop of Lego® Serious Play® dropped out and I could stay. I had read something about Lego initiatives for companies and schools abroad. Two weeks later, the facilitator, Fausto Camacho, confirmed that the method began in Denmark in the 90s, when they realized that the sale of toys was stopping because children were playing more and more with the video consoles. 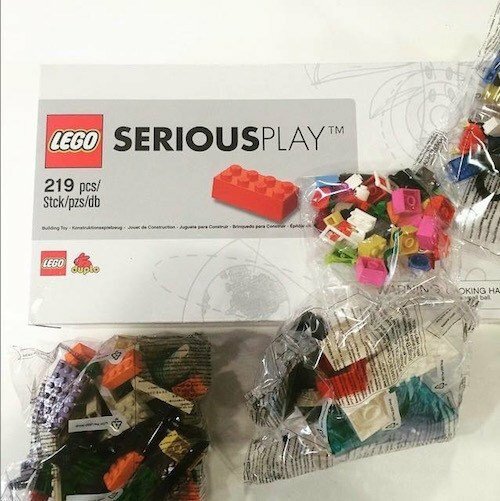 Lego then hired a consultant and this resulted in a new methodology, which walked parallel to Lego but without belonging to the organization: The Lego® Serious Play®. During the workshop, 12 people sat in a room around a large table. In front of each of us there were two clear bags of Lego (just as the ones you get at the airport to put the bottles with liquids to pass the control zone). One of them contained a few pieces, orange and yellow ones; the other was larger and contained many more pieces of all sizes and colors. We begin with the small bag. The task the facilitator requested us was individually: “Build a duck. You’ve got one minute”. As the exact measurement of time has always been a cabal to me, even with the watch ahead, I thought this task had to be done immediately, so I got carried away by the maternal instinct and thought, “Nothing can be left away to build this creature”. And I decomposed the duck: “Head, beak, wings, body, tail, legs. I think nothing is left”. I used a piece to represent each item, in order to make it a “complete” being, and I thought the others would be able to put it back on his head. I finished first, and my surprise was complete when seeing that all people took pains to represent the ducky shower, Donald Duck, any normal duck, but really, duck-shaped and everything. After the given minute, the facilitator asked us to explain what we had done, if we felt satisfied for having done it that way and best of all: “How we had felt doing the duck”. How to explain that this messy pile of pieces put together was a duck for me? I remembered the chefs making the deconstruction of the food, and I said, “I made a Duck deconstruction. It has everything, just take a look at it and imagine it”. Never take for granted that everyone understands the purpose of the project in the same way (if everyone understands it). Never assume that those who do understand the purpose in the same way also understand that the same steps and associated tasks are necessary to achieve it. Never assume that those who do understand the objective will work automatically for the project only, and not to feed their creativity, their ego or their personal interests. Now we should take the bigger bag and, with a given number of pieces, represent our ideal weekend. Translate a lot of feelings, memories, and desires to a few Lego pieces requires concentration. From hence the “serious game”, Fausto explained: “Serious” is not the opposite of “funny”; that is “boring”. A serious game can be fun, but requires active participation, effort, and work by those who run it, as well as a commitment to meet the objectives and assimilate the methodology of the game. That’s why it is serious. I set to work and created my perfect weekend. This time we had a few minutes, since the task was a bit more complex than the last. We applied the method of successive approximations. Divergence was complete: Some wanted to be completely alone, other wanted to travel, others retreating into a bed of love, others stay in the car with their family, to talk and have a good time without teenagers running away or shutting in their room. The more conceptual the issue pictured, the greater divergence in the proposals. And everyone, without exception, had one; no one left the job half done. 12 visions of happiness put on the table, all represented in small pieces and with an overwhelming sincerity. Fausto then explained that working with hands enables us to better express the concepts and to remove barriers, such as shame or prudence, to a group of strangers, obstacles that appear frequently when communicating with oral language. With our hands we are more honest, more authentic. And the ideas we communicate are so as well. Turnout was total: We all put our best so that the representation of the concept did not stay half, although some admitted that they would have required a bit more time; some began to work on the fly, others stopped to think, think and think, and then built the model in a moment: Different styles of work to solve the same complex task, with different results, all of the same quality, with a surprising diversity to choose and combine. Now that the depersonalization of human resources and the “we are all expendable” is customary, I found it a poor and almost sad concept at the astonishing diversity of human creativity. Afterwards, Fausto, during the interview that we maintained two weeks later, reminded me: “People is the most important thing”. Again, Lego returned to practice its magic. The third practice was even more complex. Fausto got us a video with different visions of people in one place: A large hospital. As I am easy to tear, I already had flooded eyes when the video was still running. With a heavy heart, I attended the task: To prepare a proposal with the hospital services to be given at a new roof that would be enabled. We could use all parts and we had more time available: At a growing complexity, we had growing media and resources. I proposed a heated pool with the blue pieces, so that everyone could use it (patients, families, and hospital staff); also a room with pets, to go and receive affection of beings who would not request any explanation back. Finally, I included what I later decided was the key element: The Screamer. When I explained it was an empty room with big windows to allow people to contemplate the horizon, but acoustically isolated so that people could go and say all atrocities they wanted, as loud as they considered necessary, I was holding the piece in my hand. Then I started to ramble on about the idea, saying that the expression of sadness should be as politically correct as the expression of joy, and even that it had to be collected as a fundamental right of the Government Constitution, and at that moment, I dropped the piece. Fausto helped me see it: When you get away from the concrete and you start rambling, then you drop the Lego piece, as it represents the concrete. I loved the match. We all presented our proposals (there were chill out areas, children's play areas, a trampoline with a mat below to simulate your own suicide, collective chat areas, living rooms to think by yourself…). Then, each of us had to choose our best proposal (I stayed with the Screamer) and finally, Fausto drew three concentric circles on the whiteboard: The small one represented the essential, the medium one represented the necessary, and the larger one represented what was desirable for us. We had to choose which ideas to include in each circle, explaining why. The final proposal would be presented to the hospital the next day for its approval. We all wanted to put our main proposal in the small circle, and the conflict of interests and the fight of egos emerged as if this were real and the hospital were truly expecting our proposals. Then I thought that a good leader is not the one with greater authority and exercises it, but who knows how to perceive what is essential to each team member and knows how to incorporate it the project, braiding it with the proposals of the rest, so that everyone feels involved, represented and as if they were “parents” of the creature, while the focus remains on the client's objective. So, the next day, when introducing the project, we would not have to head an aseptic project manager talking about an alien project, but 12 ambassadors defending their work, ready to give the best of themselves to develop it in front of the client. Again, Lego was opening doors. There were people who blamed Fausto about the lack of final agreement between the twelve of us: He explained us that the facilitator should help the group to understand the origin of the problems, of the lack of agreement, so that the group reaches its own solutions by itself. Two weeks later, he broadened the perspective: The work of the facilitator is to be present without being noticed, to subtly guide, to leave people acting for free, but giving clues about the causes of the errors and putting light where the possible solutions are. As always, we talk about handling probabilities, and the facilitator only explains them for the group to choose the best one at all times. In closing the workshop, Fausto asked us for our feedback. Afterwards, he told me that it was not to receive accolades. He asked for realities. So I asked him what the best feedback he had ever received was, which had come over him. He replied that someone told him once that a consultant would never use the method of Lego® Serious Play®, as it expands uncertainty rather than limiting it, and also noted the risk that the method could be “swallowed up” by companies rather than hiring him as an external advisor. (With the latter I do not agree. I will explain why later on). Finally, Fausto said that many companies or consultants came to see the methodology for expanding the internal information of the company, but not with the intention of actually implementing it, just to incorporate it into their “cultural heritage’ and that the ultimate goal of driving innovation in the practice of organizations effectively remained pending. Within two weeks after the workshop, I met Fausto at the canteen of the Madrid Matadero to get to know more. I wanted to bring this to Learning Lovers and I needed a better understanding. When I met Fausto, I imagined that the life of a Lego®Serious Play® facilitator would be surrounded by automation and the Internet of things, wearables, digital clothing, and electronic locks with iris reading, smart washing machines and fridges that wave good morning while requesting the supermarket for more milk in a M2M model. But in this fast-paced world of innovation, Fausto arrived apologizing for being late, as he had forgotten his home keys. Something as mundane helped me get reassured. The interview began in the opposite way: Fausto launched the first questions. What is Learning Lovers about, why we wanted to talk to him, what would we do with this information... I tell him that one of the pillars of our initiative, the innKowledge project, is to facilitate the encounter between the creators of content and training services with their customers (companies, universities, training centers or colleges). We aim to help the leaders that make the decision to incorporate a new methodology to know it thoroughly, to lose the fear of something scarcely known, and at the same time, we dialogue with the end users of the technology to transfer their needs to the supply companies, how are they implementing this innovation, what they miss and what they would change to optimize its use. And hence the Lego® Serious Play® comes into scene. 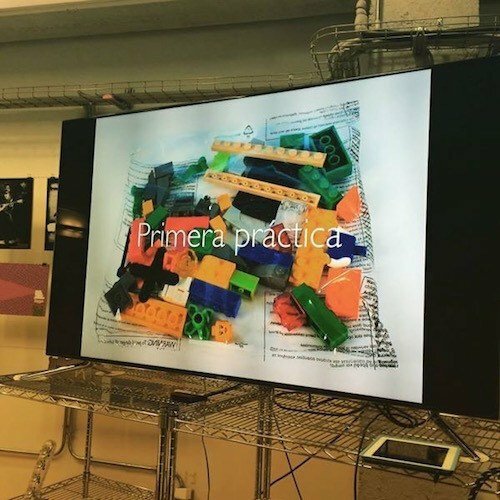 The project hold by Fausto Camacho in the Matadero of Madrid as a certified facilitator is to study the application of Lego® Serious Play® to the Design Thinking methodology. 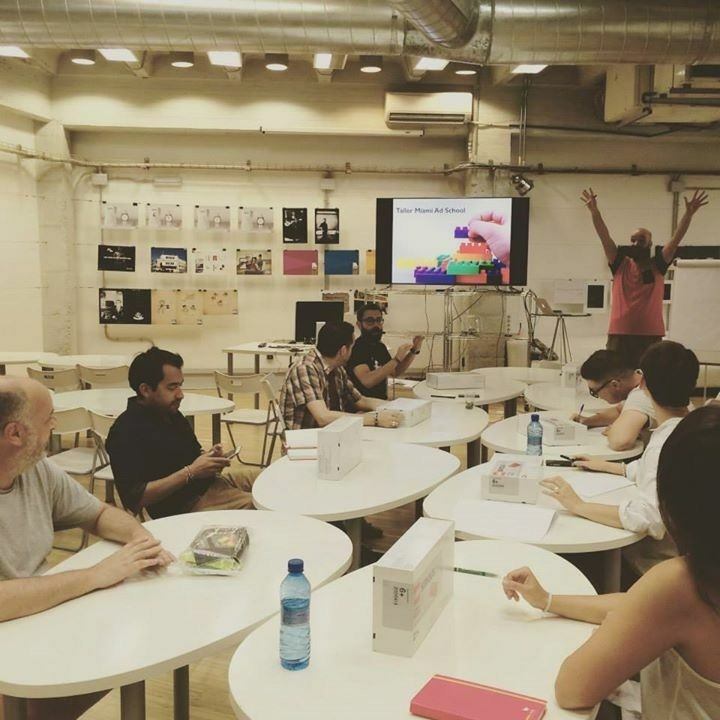 As part of the method of study, Fausto uses workshops taught in coworking spaces, as the one I was lucky enough to attend. For Fausto, the greatest value of these workshops is the feedback received, since he applies it to the workshop itself, altering, removing or adding new things in every experience. Workshops also let him experience what stages of Design Thinking are more appropriate to apply the methodology: If it is during the process, during the divergence phase, in the convergence phase... Fausto believes that the application of Lego® Serious Play® expands divergence in some occasions, so that he has doubts about when to apply it successfully in the convergence phase. However, it is precisely the wide range of profiles that can participate in workshops which gives them content: A workshop is just a container, and the content is provided by participants. The more diverse, more distinct and more curious about their own field of action the participants are, the greater the results, because more different points of view will be provided and Fausto will be able to draw a conclusion and a richer, more complete view. Fausto is a Lego® Serious Play® facilitator since April 2015. He believes that training as a facilitator has allowed him to learn how to apply the methodology, but to be a good facilitator takes much more: Knowing how to detect nonverbal information from interveners, who is going to leave the project, who is going to push it, how the diversity of profiles affects within the team, etc. All this vision is obtained with a more extensive professional background, broader the more sectors and more professional profiles are known or have been exercised. The Lego® Serious Play® methodology is applicable to management teams, project management and identification of the mission, vision and values ​​of the organization, among others. Faust believes that the methodology is not easy to apply in Spain because a paradox occurs: Large companies already have a certain way of doing things and they are not willing to change it, while new companies have no present (as they create it on the up), so it is very difficult to pose them a future perspective. Fausto says that the methodology of Lego® Serious Play®’s fundamental value is that working with everyone in the organization or with everyone in the project is a must: All of them will participate during sessions with equal responsibility and equal conditions. He has doubts as to whether this is consistent with our corporate culture, in which hierarchies proliferate, and with the value of immediacy of results that prevails today with the crisis. In an organization, the way of doing things, the vision and mission are already given, and we must implement the methodology in a way of doing things that is already running; however, in this dynamic we must find and be able to apply the tools to reach assess on what's wrong with the process so that a project is not delivering the expected results. Fausto says that we proceed from a passive culture where people expect to find a work before coasting to create it, but now the trend seems to impose that everyone has to be an entrepreneur and this makes us live in a counter moment. Lego fits very well there, because it allows to create a falsification of reality without the risks of playing with reality itself. Customers can experiment with models of their projects, its mission, vision and values, and take a first-hand look at the results without risking a real decision. The methodology of Lego® Serious Play® requires a realistic goal from customers, a commitment by all members of the organization to that end within a given time and the will to carry out the tasks set after achieving a deliverable or model of the objective to be achieved. It is important to control the previous level of customer expectations regarding the application of the methodology, because sometimes the client has expectations that the methodology simply cannot give, and in this case it is preferable not to accept the draft, since failure would be guaranteed. In each application session of the Lego® Serious Play® methodology, which can vary from four to forty hours, an achievable goal is posed and the result is a model made ​​out of Legos, which is nothing but a deliverable of what it is to be achieved. The steps to take and the responsible staff to take them get fixed and from that moment it is the company who must comply with the commitment to implement those tasks. Lego® Serious Play® helps to identify the errors and establish the tasks to achieve the goal, but does not tell the company how has to perform those tasks or guarantee that will be carried out. That is the responsibility of the company. And that is the great challenge of this methodology: It only works if the company is doing its part and really allows executing all tasks involved to solve the problem identified, putting the economic, human, and technological means to do so. You can expand the scope of the methodology by tracking three, six or twelve months after the preparation of the deliverable, to check whether the company really has met the objectives and identify the causes of any deviations, but this is considered a different phase and it involves its own cost. 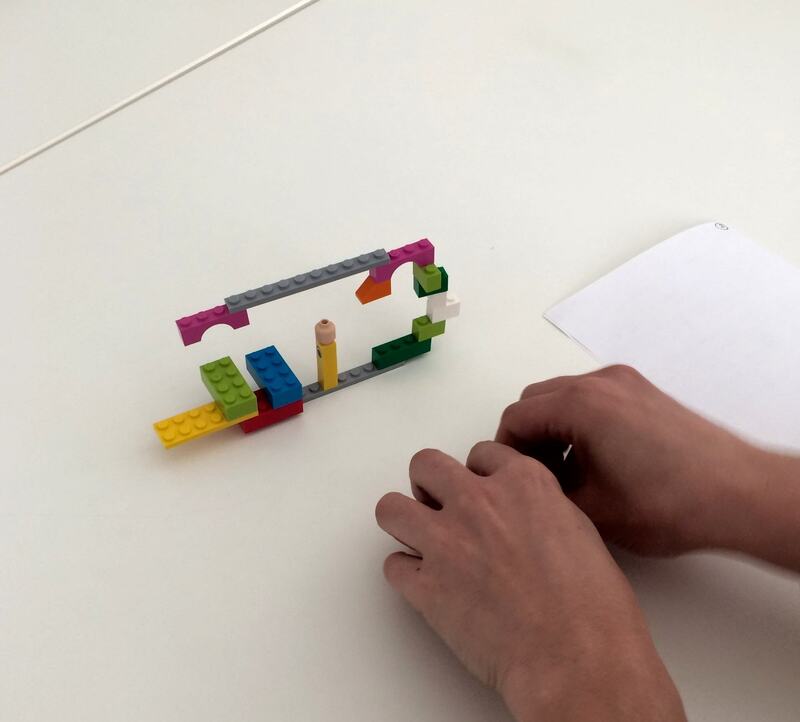 Fausto tells me with astonishing serenity that, shortly after beginning the process of applying the methodology of Lego® Serious Play® to Design Thinking, he had a short break: He was hospitalized for cancer and had to be operated. Now he performs follow-up tests every six months so that his future has limits that are repeated every six months. “We believe we are eternal and business does it too, but we do not know what is going to happen”, he says. While telling me so, I suddenly understood the meaning of the hospital’s roof proposal during the workshop, why was he interested in applying the methodology to improve the situation of the various people who spend many hours in these facilities. I realized that Fausto was applying the methodology to his own life, to his own circumstances. He had made his profession in a way to improve their quality of life, and their own circumstances had given him an excuse to raise a specific objective in conducting workshops. Therefore, I cannot disagree more with him when he says that the consultants may engulf the procedure successfully without a facilitator: A person like Fausto, capable of achieving to braid his projects to fuel his life and to live according to the results of his own job, is simply irreplaceable. While talking to Fausto, I admit that I envied him: That man had managed to give a full meaning to every minute of his life, with the certainty of him who observes his career from the future, looking at himself from his “me” in six months from now: Each day for him is part of a successive chain of steps leading directly where he wants to be in six months. And every six months, the process is repeated to achieve new goals. Accustomed to a mist-shrouded perspective, facing a future where the only certainty is change, the peaceful vision of Fausto made ​​me feel a deep and quiet admiration. And what does Fausto think for the future? In gamification, in schools, in children. Fausto believes the approach to teaching that we have today is wrong, because in schools the natural creativity of children is being eliminated gradually, but then when we get to become adults we realize that it is necessary and we want to recover it. It's as Woody Allen said in that movie: Being adult is like dressing with a gray hat, and through that hat we see life, forgetting to play. The game is the most creative part of life, so Fausto doubts that the subjects of art, which are those that encourage creativity, must still be considered the last in the scale of the hierarchy, compared to the preponderance of physics or mathematics. Lego and gamification have much in common, so Fausto would like to know what can come out of that combination.